Cash In My Crap, an online retailer that buys unwanted smart phones and tablets, announces the launch of their new user-friendly website. 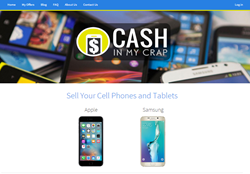 Cash In My Crap, an online retailer that buys unwanted smart phones and tablets, announces the launch of their new user-friendly website. The newly launched website features simple-to-navigate menus to make it fast and easy for users to sell their devices for cash. Unlike other phone buying websites that are crowded and congested, Cash In My Crap provides users with quick clicks to select the device they want to sell then prompts them to choose a carrier (or WiFi) and then proceeds to the condition of the device. After a few simple clicks of the mouse, a user can get an instant cash offer that's good for two weeks. Users can select how they want to receive their payout by choosing between a direct deposit into their PayPal account or receiving a check by mail. Additionally, users can get an extra $5 on top of their offer if they choose to use their own packaging along with the free FedEx shipping label sent to them via email. Additionally, users can sell their smart phones or tablets in any condition – mint, good, or broken. Selling your cell phone is a quick, easy and enjoyable process with Cash In My Crap and users have another alternative at their disposal to get the cash they want from their used or unwanted devices. Our goal is to give our customers not only the best possible price for their wireless device or tablet, but to also provide them with the best customer service possible. We try to make every transaction we do as easy as we can for our customers by providing them with everything they need to send us their device like a free shipping label, and if they need it, free packaging to return their device in. We look at the devices we receive the same day we receive them, and get our customers paid as quickly as possible. We hope that if we treat people right they will keep coming back to us. Please call or email us for more information about Cash In My Crap at (844)692-3555 x128 or info(at)cashinmycrap(dot)com.